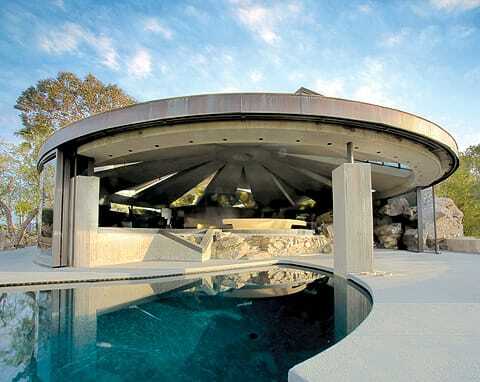 John Lautner, a "radically climate-based architect," found his inspiration in nature and sought to unify structures with the landscape. The architect John Lautner designed for the desert in an inspired way, if, just this once, the notion of inspiration is admissible. It might be equally true to say the desert inspired the Los Angeles-based architect and gave him ideas for structures. Lautner’s desert projects look so well suited to their respective settings, in fact, that an observer might assume that the flinty, movie-star-handsome architect, who died in 1994, had a special affinity for the desert. It is nearly impossible to imagine masterworks like the Elrod House and the Desert Hot Springs Motel in any other setting than the Coachella Valley. Then again, Lautner designed in an inspired way for every climate he encountered, according to Frank Escher, the organizer of Between Heaven and Earth: The Architecture of John Lautner, a multimedia retrospective exhibition at Palm Springs Art Museum from Feb. 20 to May 25. One theme to follow through the show is the way that Lautner pushes his buildings to respond directly to the realities of weather and terrain. In Harpel House #2 in Anchorage, Alaska, the architect designed the whole house around a sun-catching device to concentrate both light and warmth on short winter days. An opposing setting is in Acapulco: where “the climate is incredibly humid and it’s important to catch every breeze you can get, the walls (of the Arango Residence) roll away,” Escher says. In the same house, the ends of the roof angle upward to catch breezes from either land or sea, depending on the time of day. If Lautner had a favorite climate, it was likely that of the green forests of his native Michigan, where he traveled annually to spend part of the summer. “His ideal was a cool, verdant environment where he could think and refresh himself,” Escher says. Yet exploring new places was high among Lautner’s priorities, according to Escher, who is a partner in Escher Gune Wardena Architects of Los Angeles and official archivist of the Lautner Archives at the Getty Center. Lautner, he says, had “this incredible interest in nature and geology and topography.” The architect, he adds, “enjoyed the desert as an environment as much as he enjoyed all other interesting landscapes,” Escher says. The fact is that the one-time student of and apprentice to Frank Lloyd Wright was little less than obsessed with the variety of landforms and weather in the world. 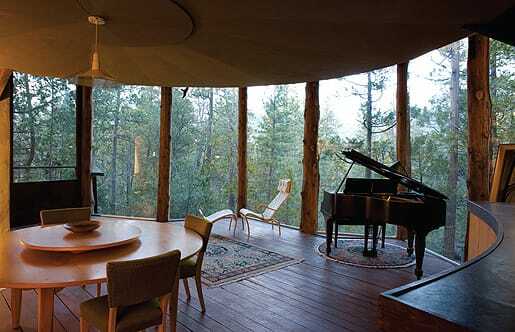 Lautner constantly sought new forms and ideas in nature. His thinking was probably influenced by Wright’s conviction that natural forms could provide suggestions for structures both beautiful and efficient. Another Lautner landmark, the Desert Hot Springs Motel, part of his early, socalled “Googie-style” commercial buildings is all too rare. The 62-year-old building can still set a space-age mood and cast dramatic shadows. Lautner had the ability to “unify the style of the architecture with the landscape,” says Sidney Williams, curator of architecture and design at Palm Springs Art Museum. 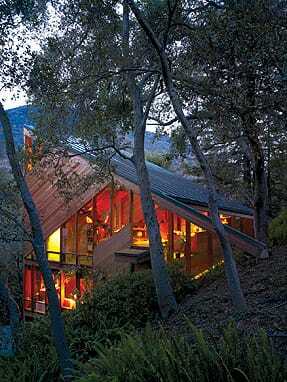 Like Wright before him, Lautner incorporated the landscape into his buildings as part of the total design. Witness the way the architect wrapped a garden of desert plants along the exterior windows of the motel’s front office. Even more remarkable are the eaves or outer edges of the roofs, which let breezes in while lighting the interior with indirect light reflected by a sun-catching wall angled in a way to reflect a comfortable level of diffused sunlight into the house. As the exhibition organizer, Escher brings unusual credentials to the task. 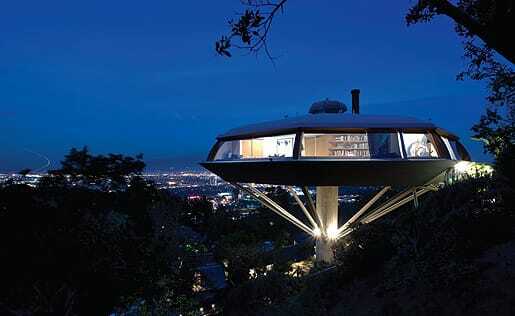 The architect, together with architectural partner Ravi Gune Wardena, restored Lautner’s Chemosphere house, in the Hollywood Hills, an octagonal cake pan balanced atop a baseball bat. Escher also wrote the first important book about Lautner in 1994. But does Escher know how the strong-minded Lautner got along with the privileged and storied residents of the Palm Springs of an earlier period? 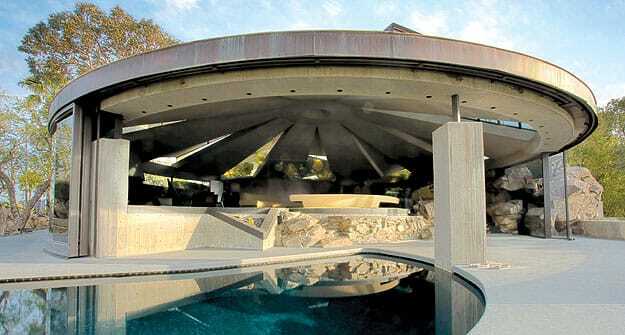 John Lautner’s career spanned six decades and produced more than 150 built works. 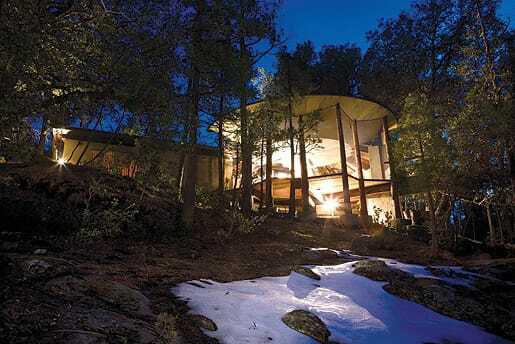 Locally, Lautner designed a mountain cabin in Idyllwild, a motel in Desert Hot Springs, and a showcase house for designer Arthur Elrod in Palm Springs. 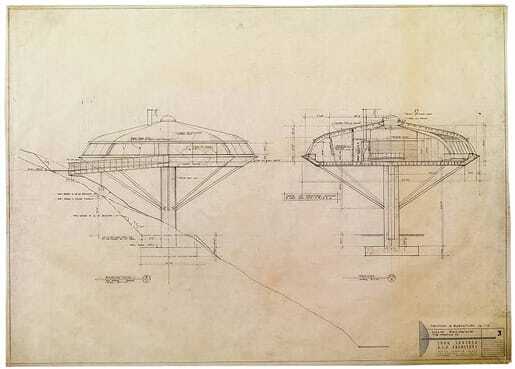 Between Heaven and Earth: The Architecture of John Lautner is the first comprehensive overview of the architect’s work. It includes 115 original drawings and sketches, 10 original models, six large-scale architectural models created for the exhibition, and a documentary film. 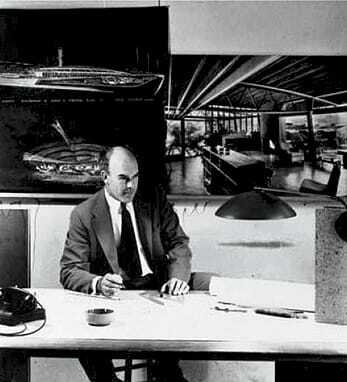 John Lautner in his office, circa 1957. The exhibition panels behind the him illustrate exterior and interior concepts for Henry’s Restaurant in Pomona and an interior view of the Gantvoot House. 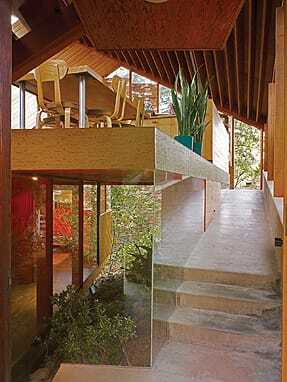 Walstrom Residence, Los Angeles, 1969.